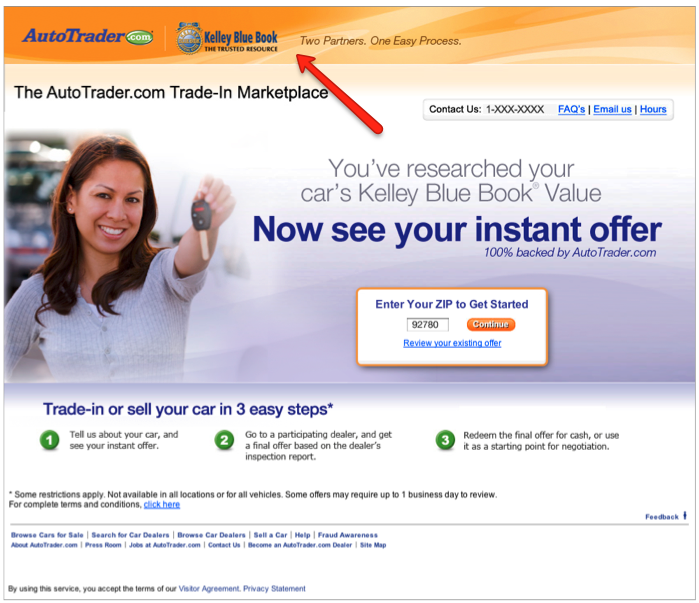 AutoTrader.com takes the first step in integrating their Trade-In Market Place into the KBB.com trade value service. 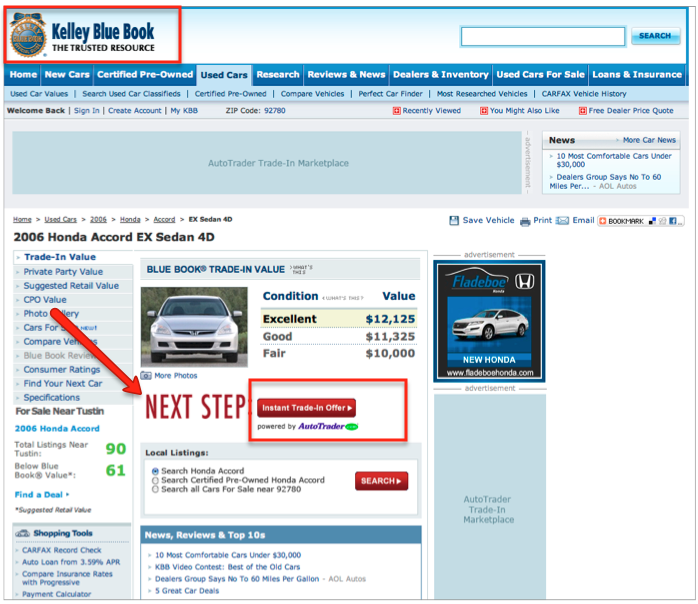 As you can see in the screen shots below, after a customer has stepped through the traditional Kelly Blue Book online trade-in evaluation process and received the KBB value on their trade, they’re now given the option to receive an “Instant Trade-In Offer” powered my AutoTrader.com. This is currently only being tested in select markets. I’m impressed to see how fast AutoTrader.com moved with this integration. I sure this is a nice win for the TIM Buying Center dealers. TIM, good for autotrader, good for manheim, good for Hollenshead, not so good for joe dealer. Chad, what makes you say that? I have some dealers and sales people gaining some great benefits from it. There are benefits to it, and in most cases the pros should out way the cons. For us we had managers using it that relied on it as a way to appraise vehicles. We had a couple that gave us higher than expected amounts, and then when we took them to manheim they made sure to find more wrong with the vehicle than what we put down, thus lowering the bid. I would think it can be a positive IF the number comes in near the KBB price. In the screenshot it shows good as $11,325. If the offer comes back at $9500 what is the chance of seeing that guy in your store? With this piece being on KBB.com, the lead would go to the nearest buying center. That dealer/buying center could call the customer and offer him the opportunity for a “better” price. At least he’s now less fixated on the high KBB number. I’m sure since Autotrader now owns KBB.com, we should see some changes in this sometime in the future. Who has control of the bid price? Hollenshead! If I were them I would be bidding high trying to get cars to sell. Ever try buying a Hollenshead car at the auction? They know what they are doing. It was pushed to us so it would work like Jeff said, but if you look at it from Hollenshead’s point of view why would they care if we look like the good guy offering more. Great concept, like everything it has its flaws. Why would they bid it high? If they did they would lose money if the car was returned to them. The process is solid if worked. If it isn’t worked…well, you get what you put in it. My understanding is the TIM appraisal tool is designed to help dealers close more deals, and KEEP retail inventory and attract opportunity they may not have had for FISBO sellers. I think we can all agree that the most contentious part of a sale and when it could go south is at “first pencil”. This could remove some of the tention through transparency. I believe the consumer simple wants some logic to the number and the question of “how much is my car worth” ? I dont believe it was designed to send cars to the auction. If I knew it was a unit I was NOT going to keep for retail and could not re-wholesale it to my local buyers then I would put up on a lift and walk it with a paint meter. That may be 1 out of 20 cars. I think of it as an insurance policy in worst case senerios. I can see where the TIM tool would sure cut down on calls I make to local wholesale buyers on units I dont have much knowledge of or track at the sale. I know that call is costing me $500-$1000 per unit, 4 to 5 times per month. Have you ever tried to buy a Hollenshead car on friday in Manheim? They can afford to be aggressive, and we had aggressive bids. It was pushed to us as they would give low bids so we could bid higher, that happened on the junk they didn’t want to own. Agreed TIM was not designed to send cars to auction, but I would guess that was Hollenshead’s plan, or why else would they do it?